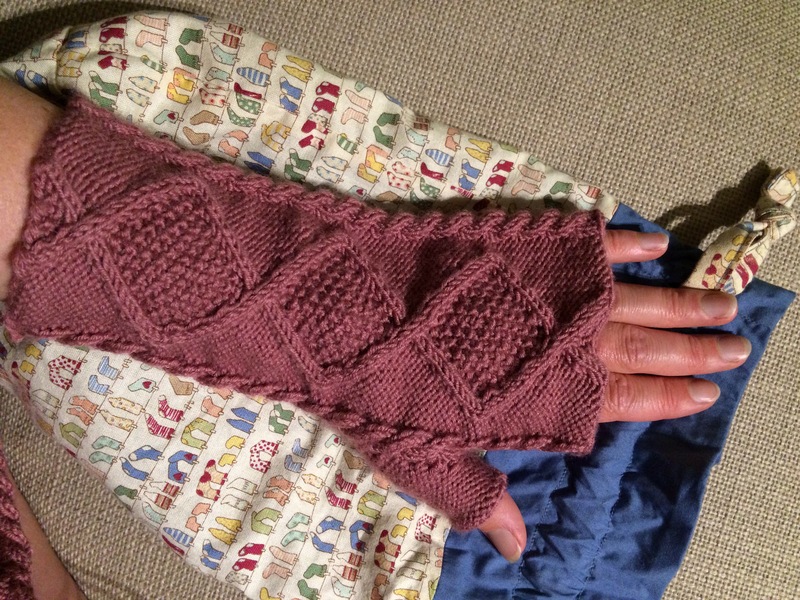 I finished one of my Rose Tyler’s fingerless mitts ! It’s a bit roomy on the hand, but I think I can live with it. 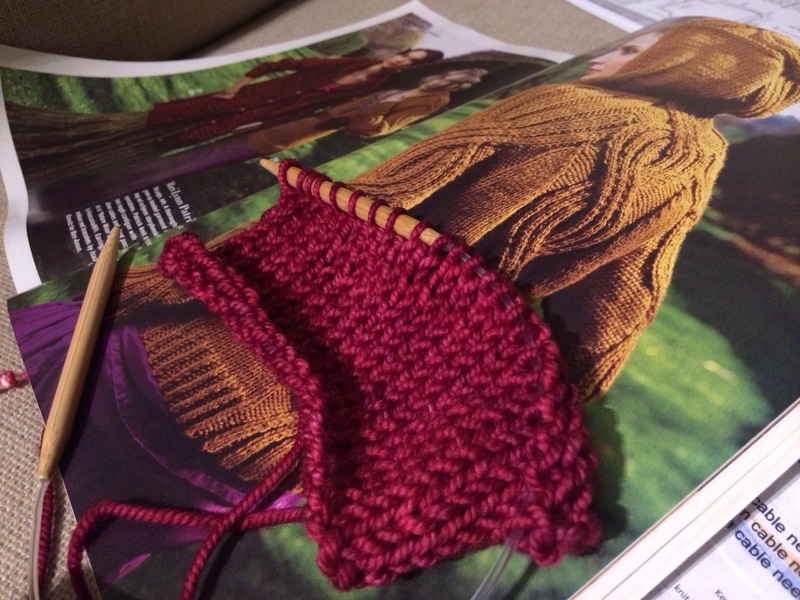 I’ll do the other thumb tomorrow– I’ve been knitting too late these days! Well! Here are the contenders, before the toe-down began! 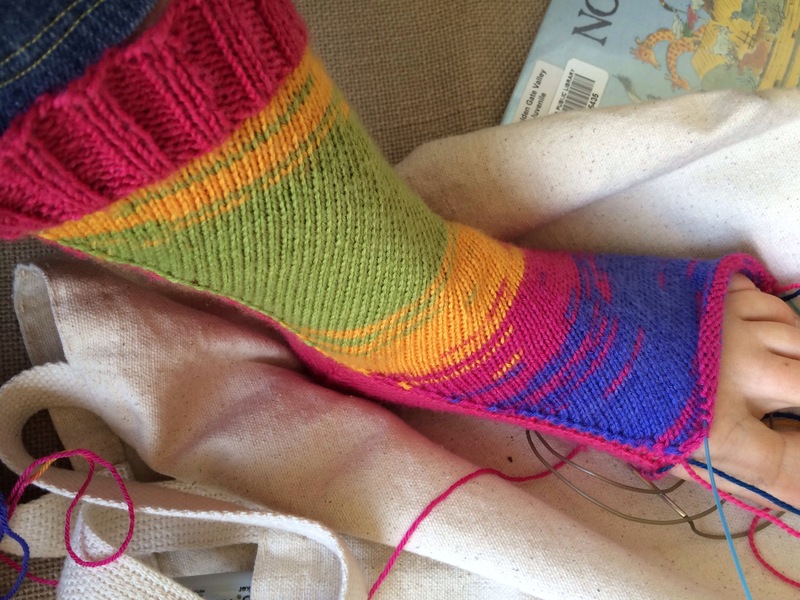 The two pairs of socks prepared two-at-a-time on a circular needle, ready for the ties to be knit! 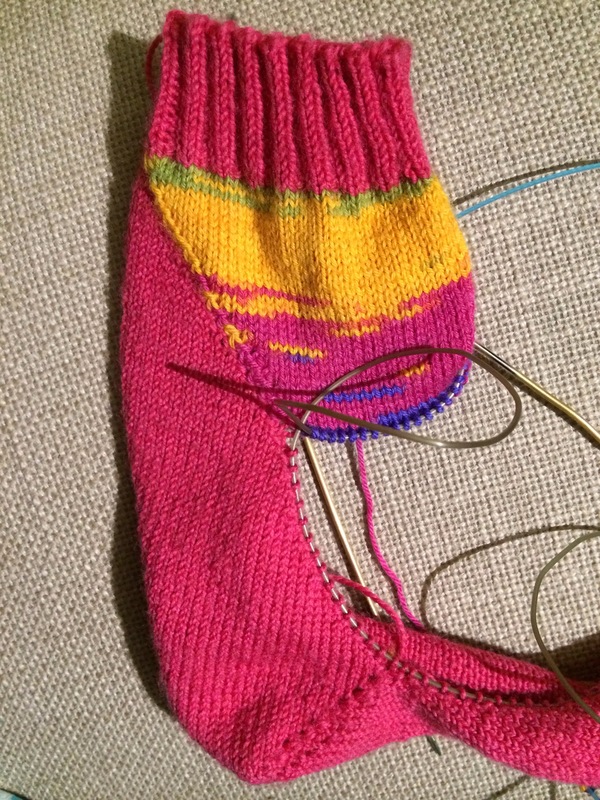 The other contender’s socks were in a similar state, but I imagine she’s either finished by now, or she will have finished by noon tomorrow! But I also have a great number of ends to weave in! 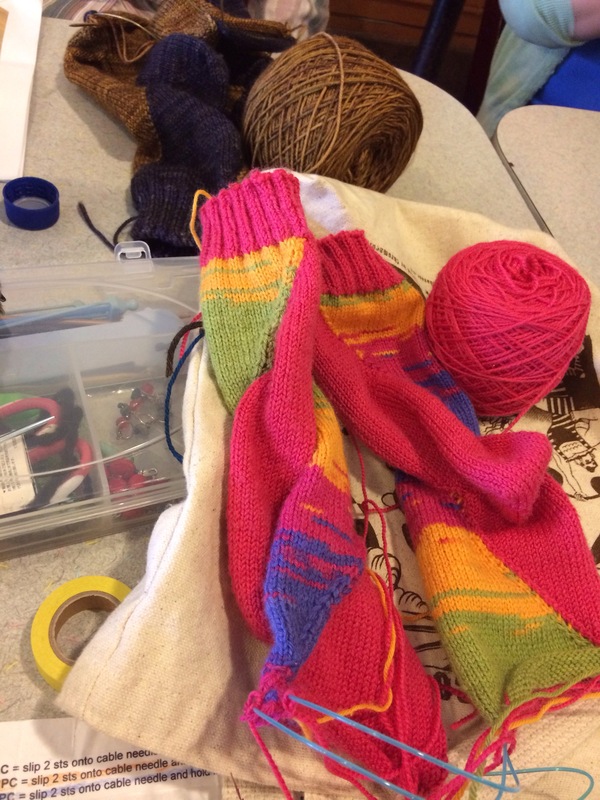 My Pole Dance socks are in break until tomorrow night, where we will have a toe-down at knit night. I am geekily excited about that! 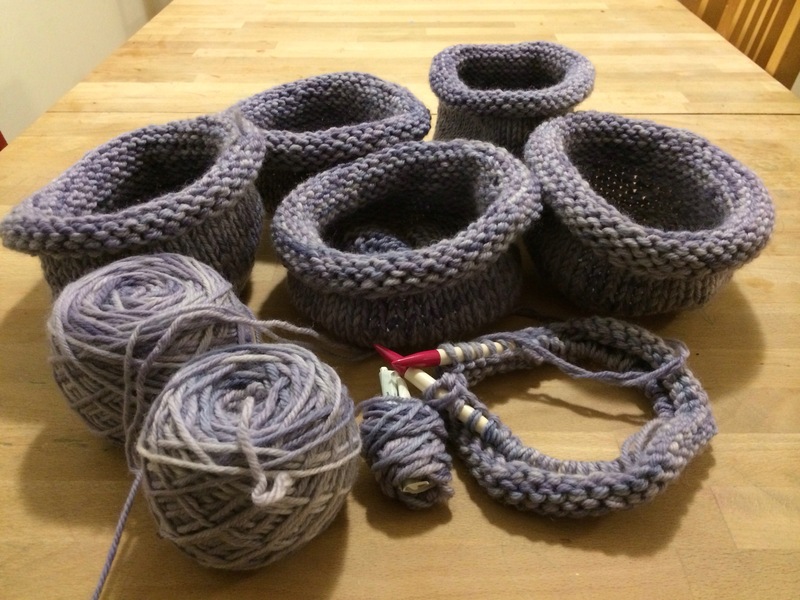 My plan is to knit nests until I’m out of this purple yarn, then I’ll felt them, and I’ll take a break from knitting nests. 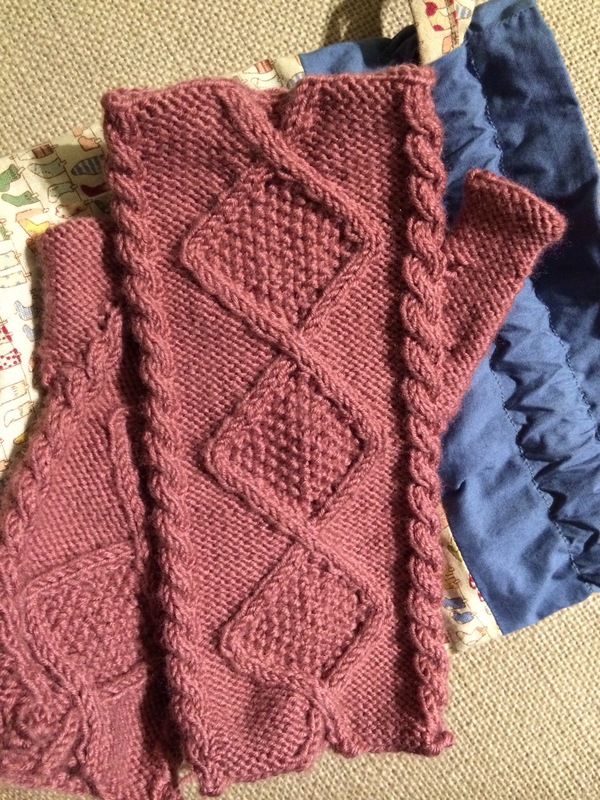 I also decided that my Rose Tyler fingerless gloves had been neglected for far too long, so I picked them up again, only to discover that I had no clue what was going on. It took me about ten minutes to figure out where in the pattern I’d left off. This is a good lesson in WIP management! Don’t have so many projects that you neglect one so badly that you lose your place! 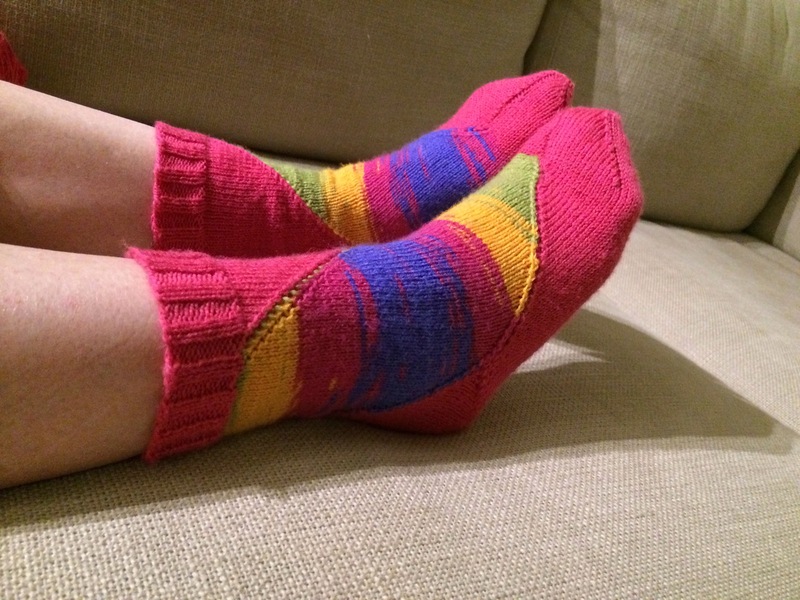 Between yesterday evening and tonight, I was able to recoup what I had to frog yesterday on my Pole Dance socks. I really kind of freaked out when I tried on the mistake version and found that it was too tight and didn’t swirl nicely… Such a relief to have it corrected ! 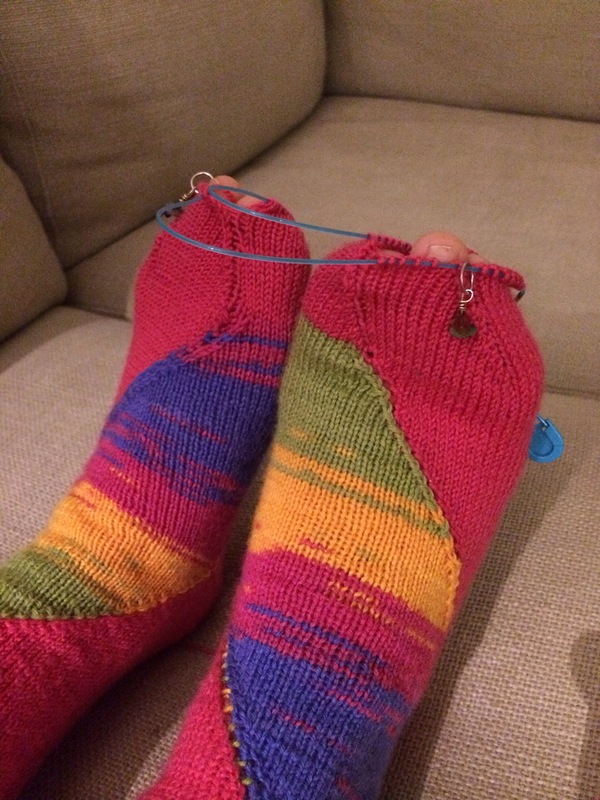 I ‘ll get both set up to knit the toes, then wait til Tuesday knit night to have a toe- off with the friend with whom I’m in friendly competition! 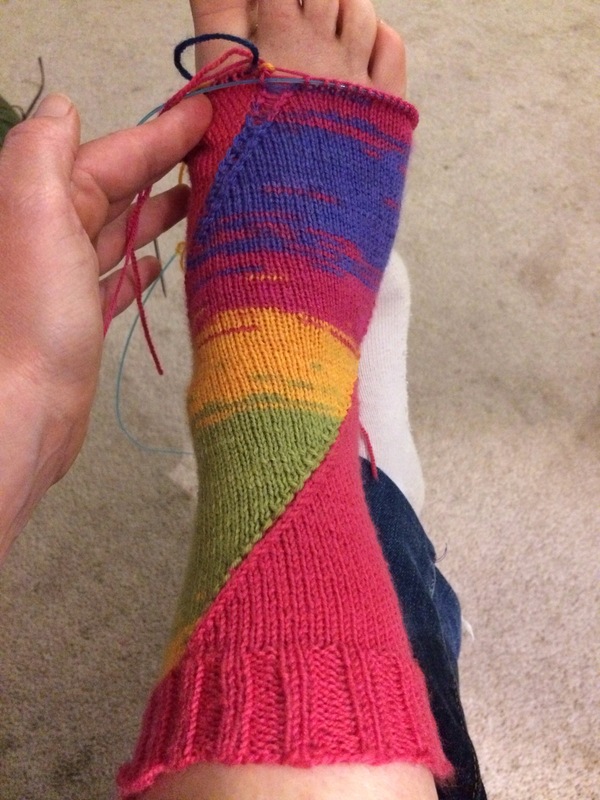 I had an insane amount of time to knit today, and I was able to complete color #2 on my Pole Dance socks. 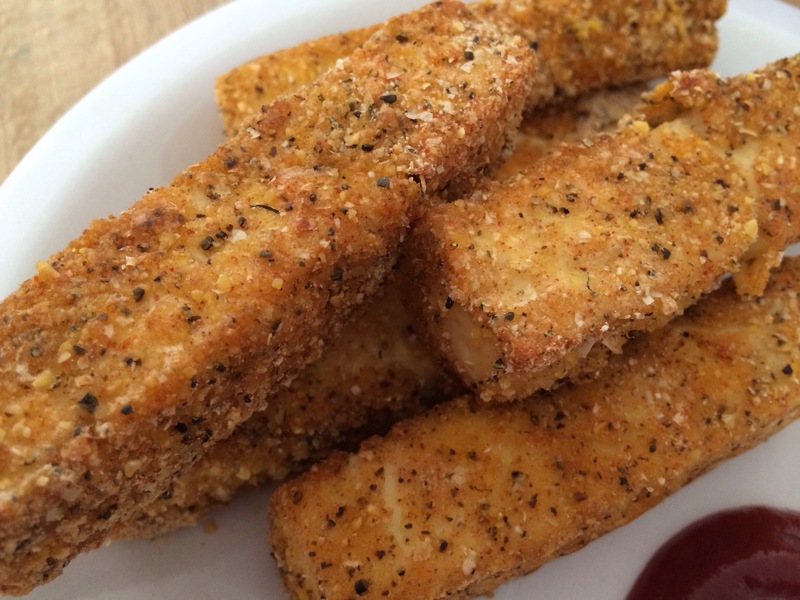 Unfortunately, I did it wrong! The entire section twists the wrong way and is unwearable ! Unprecedented progress/it’s all her fault! 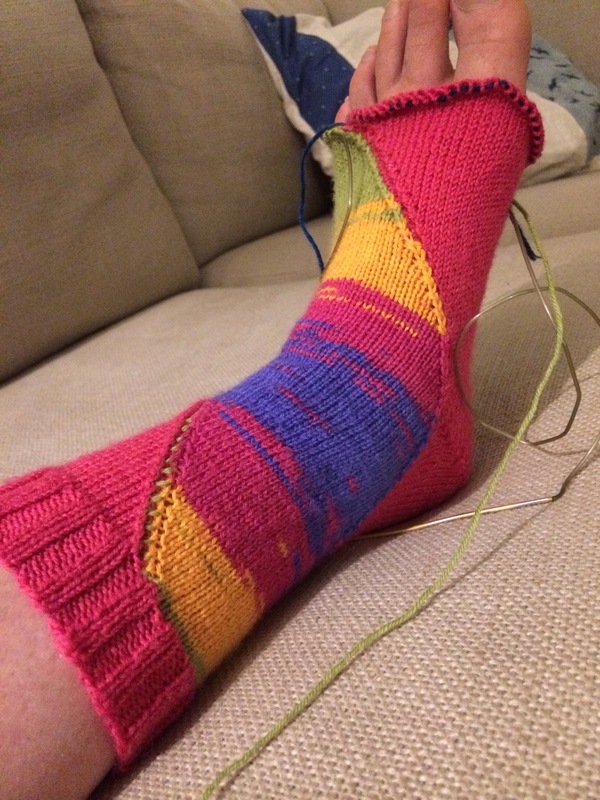 Confession: I have something of a competitive nature, and a friend who is also knitting the Pole Dance socks in our current KAL has been making great progress with hers. 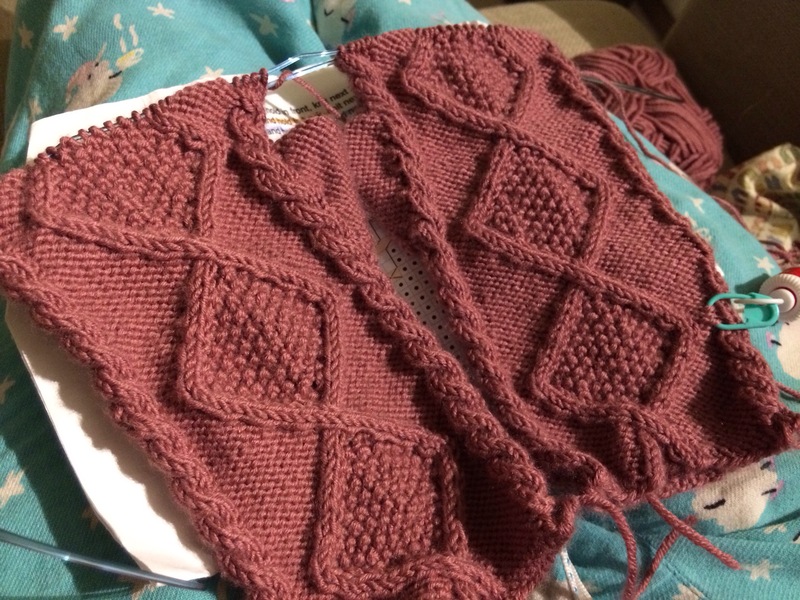 Each time I see her latest WIP photo, I’ve been motivated to keep at my socks. I don’t want to get too far behind!!! And this includes a setback in which I had to frog the entire blue section and redo it. 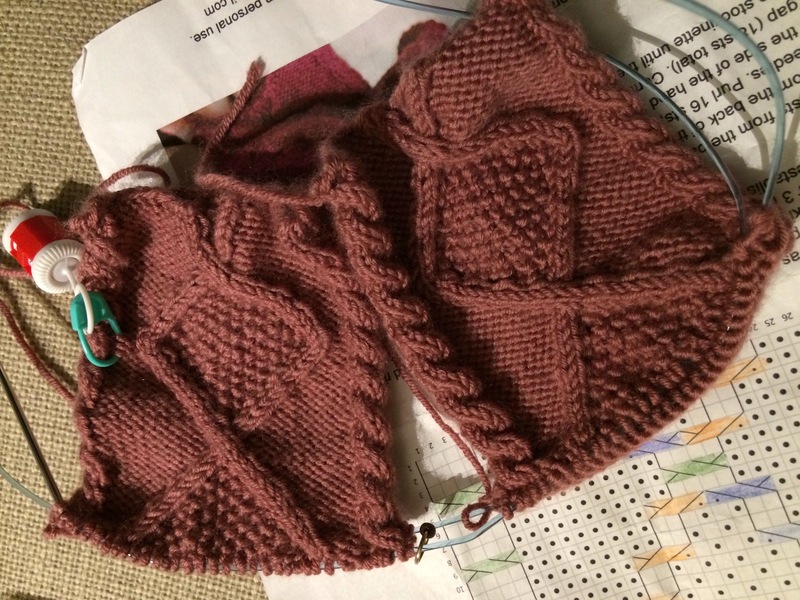 (I was forgetting my ssks at the beginning of the RS rows!). 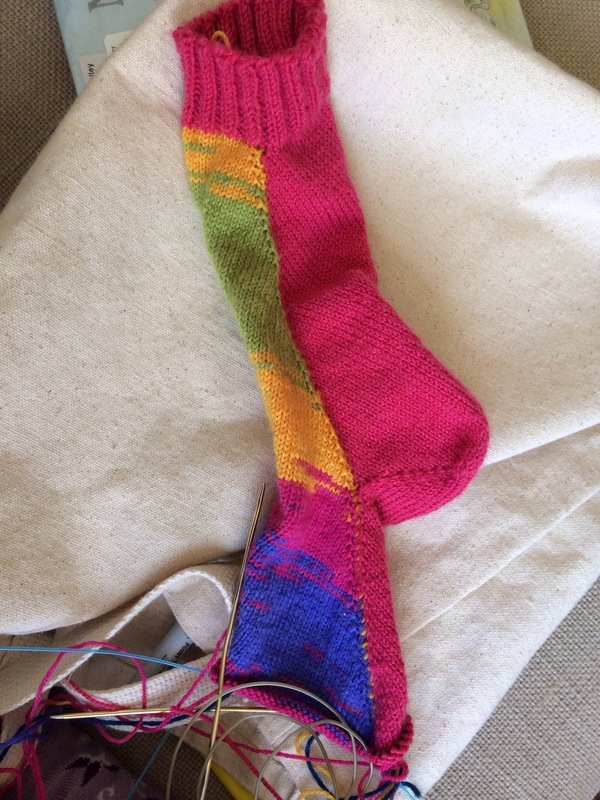 Now it’ll be put on a holder until the second sock looks similar (but with different color sequence- I’ve decided to let them be fraternal).